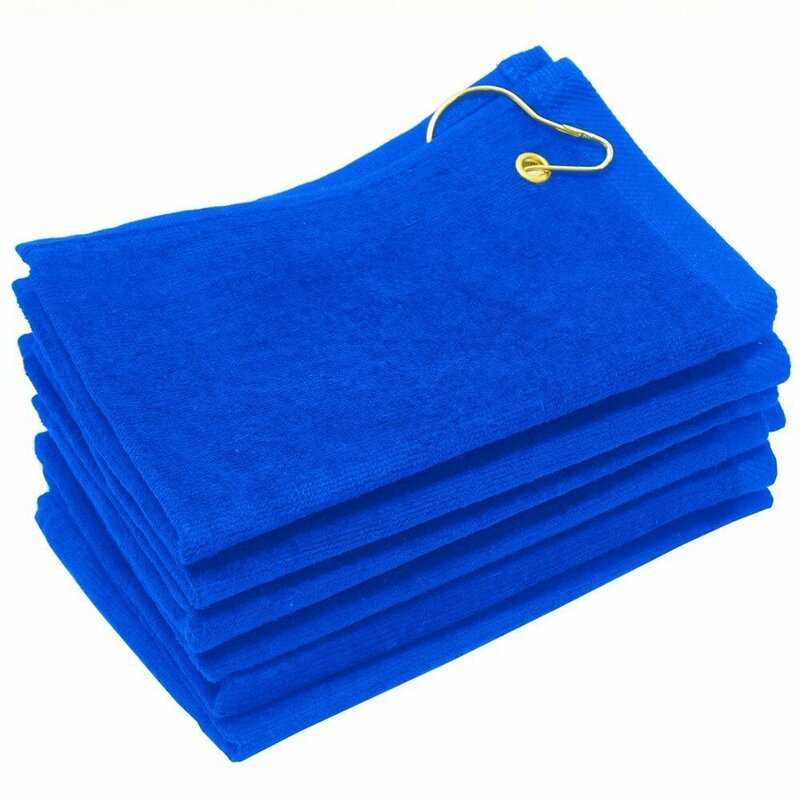 16x24 100% cotton high quality terry velour golf towels in royal blue. These towels have a corner grommet ideal for use in golf courses, easy to hang. Want to make it easier for the golfers who are your customers, employees or friends to have all the equipment they need on the greens? Be sure they're never without a golf towel with a handy grommet attached. Golfers regularly use golf towels to wipe off their clubs, not to mention their brows! At 16" by 24", this blue golf towel is the perfect addition to any golfer's bag! Plus, it attaches neatly and stays in place through 18 holes — or more. Have you worried about spending too much on your supply of golf towels? Worry no more with a little help from Towel Super Center. We've already done the negotiating for you, so we're able to pass along deep discounts that get even better the more units of towels you order. Why break the budget on golf towels when you can get the best for much less than you thought? Are you planning to host a golf tournament or fundraising event this year? Give away a blue golf towel with grommet, and you'll be the hit on the green. Golf towels like these make spectacular giveaways because they can be used immediately. Plus, they'll hang on participants' bags for the long term, reminding them of the fun they had at your charity event. Forget about giveaway items that aren't relevant to your golfing participants. Place an order for wholesale golf towels with us. Could Your Business Use Golf Towels? As friendly giveaways to customers who order something relevant, such as new woods or irons. Toss a blue golf towel in with their order, and they'll be surprised and happy at your thoughtfulness! As a way to brand your company among clients who golf. Simply get as many units of one dozen wholesale golf towels with grommets as you need. Then, hire a local embroiderer to add your image or logo. When you meet with prospects or deal with customers who are golfing enthusiasts, offer them towels. They'll appreciate your gesture and remember it later. Plus, your logo will be front and center the next time they hit the course. As a bonus for renting golfing equipment, such as golf clubs. You don't necessarily have to give away your supply of blue golf towels. Instead, why not hand them out to people who rent equipment from you before using your greens? That way, they'll have the proper towel to carefully wipe off their clubs and hands, which will help your equipment last longer. As a piece of retail merchandise. Feel free to buy wholesale golf towels in blue or another color, then have them monogrammed or emblazoned with your logo. These can be sold to golfers with the proceeds going toward a charitable cause. It's never been easier to get the towels you need for all your business and residential uses!